I’ve been thinking about my mom a lot recently. It’s only natural. Back in February, I took a trip out to California, where (among other things) I took the time to say goodbye to her. My mother has dementia, and while she may have many months left to go, she is far along in the progression of that disease. Her memory has failed her, but I’m finding comfort in my own memories. It was not surprising then, that a few weeks before I left for that trip, I thought of my mother’s birthday cakes. 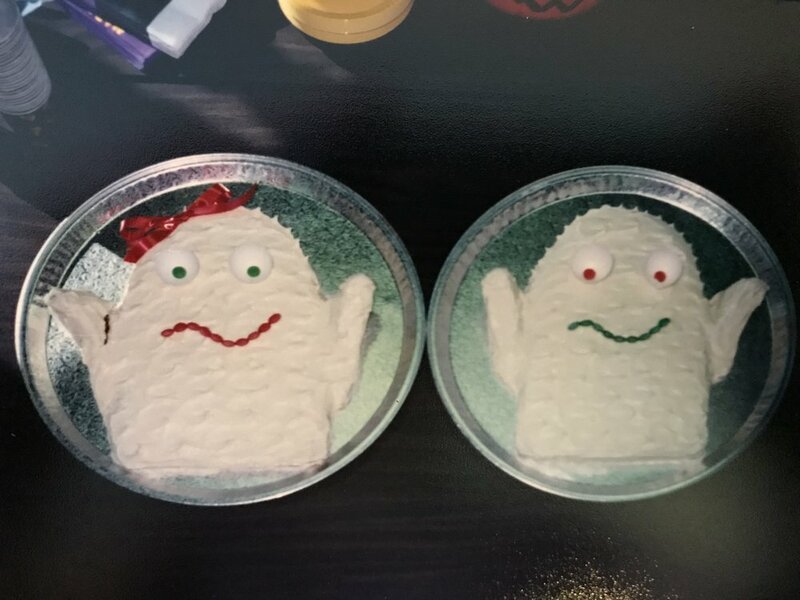 Growing up, we had two cake-decorating books that I absolutely adored. The pages, I recall, had become a little loose with wear. 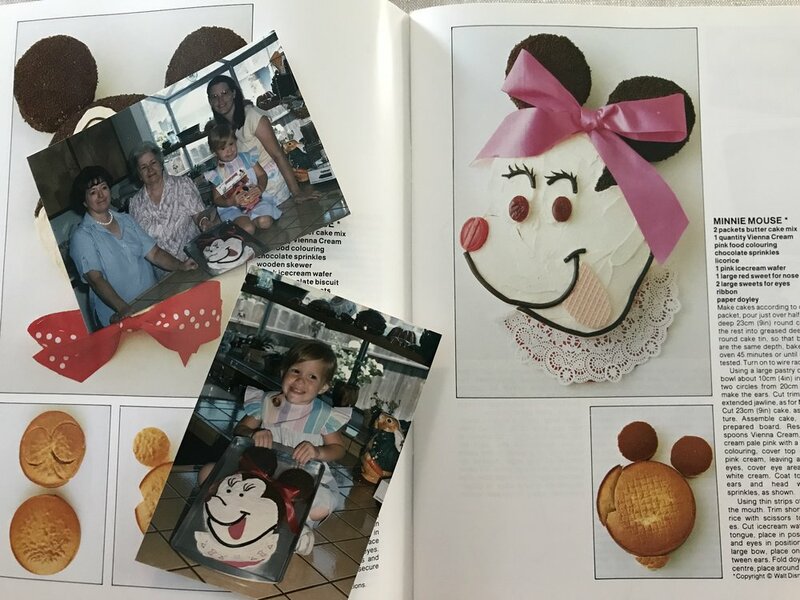 In the weeks leading up to our birthdays, my brother and I would flip through the pages to pick out the perfect birthday cake. Then my mom would make it and even in the pre-Instagram age, it would be photographed for posterity. The books fell out of favor as we grew older. 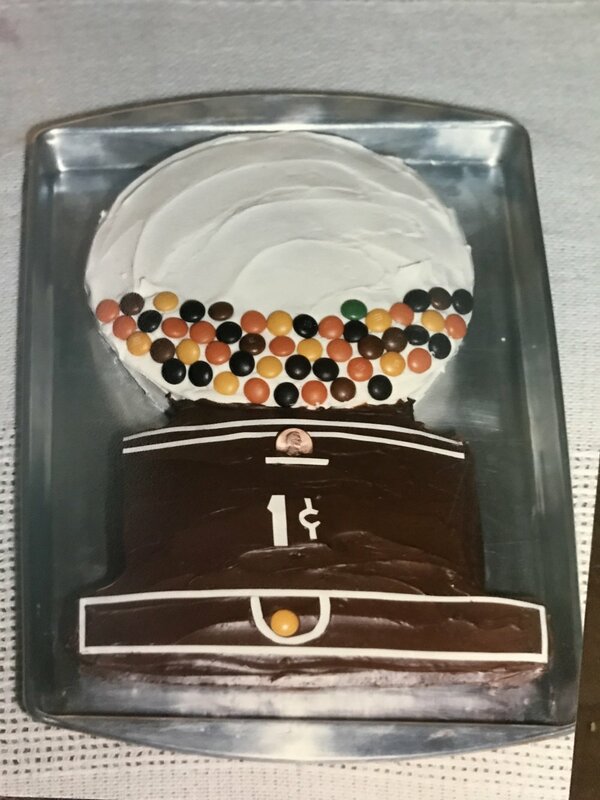 The books were used for the last time sometime when I was pre-teen - my father and brother were out on a Boy Scout trip and it’d just be me and mom for my birthday, so in a fit of early nostalgia I requested a large tiger cake as a nod to my love of Winnie-the-Pooh’s Tigger. The cake was huge, and my mother was by then diabetic, which meant I largely ate the cake alone. I made it through the tail and hindquarters before throwing the rest away. Still, she made it, all I had to do was ask. I didn’t think of the cake books much after that and it didn’t come to mind when I made a list of items I wanted from my mother’s house when my brother moved her from our childhood home. So I caught myself a bit off guard when they sprung to mind a few weeks before my trip. I was struck by one of those late-evening obsessions. The original copies of the cake books were gone or buried deeply in my brother’s garage, perhaps I could find them online. A Google search for “1980s birthday cake book” gave me the titles I needed (as results one and two at that), then a few minutes of searching used book stores online and a $10 charge to my credit card later, both books would soon be mine. They were waiting for me upon my return from California, about a month in advance of Little Miss Cleaver’s own birthday. 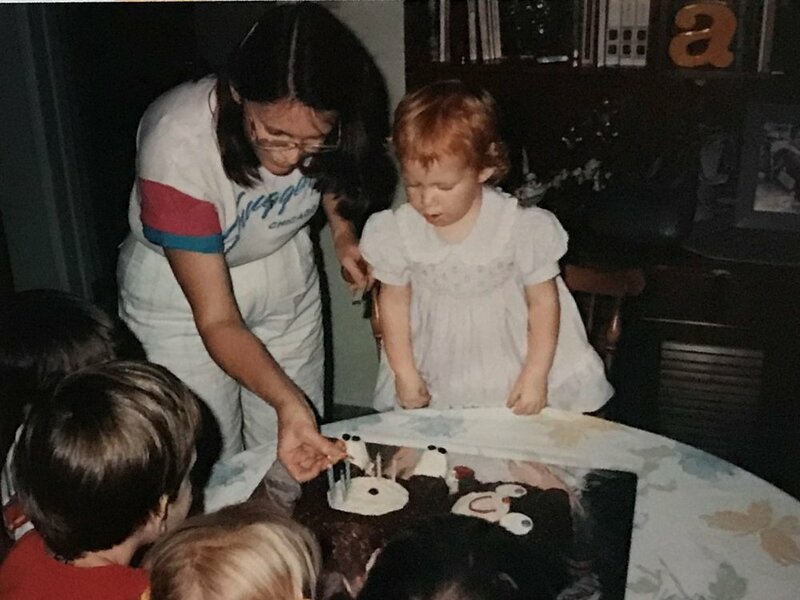 I shared the books with LMC, who was a bit less enthused than I had hoped, (though in her defense photography and styling from 1980 doesn’t age particularly well), but in the end she did select a cake. I did my best attempt at the Butterfly Cake from The Australian Women’s Weekly Children’s Birthday Cake Book for LMC’s 6th birthday, which just passed. 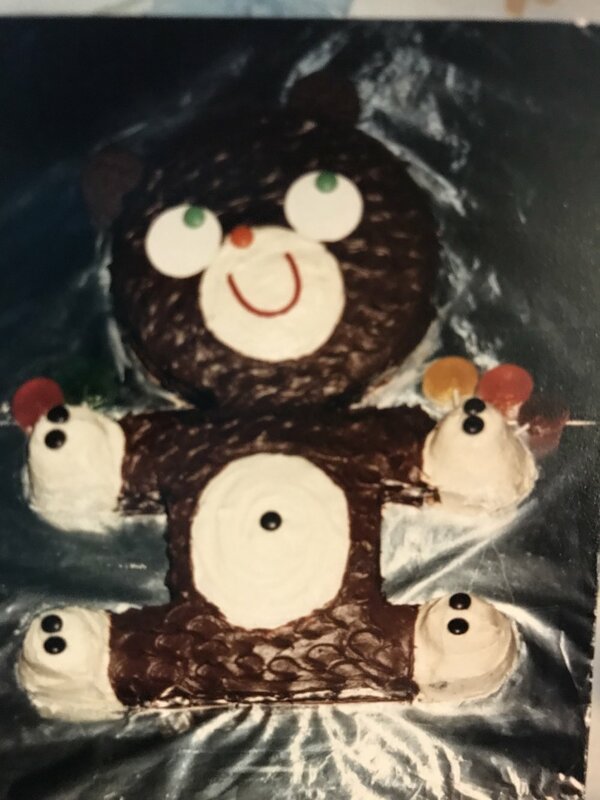 A cake design that my mother had made for my own 4th birthday back in 1987. I think her version was a bit more elegant, but mine passed kid muster all the same. 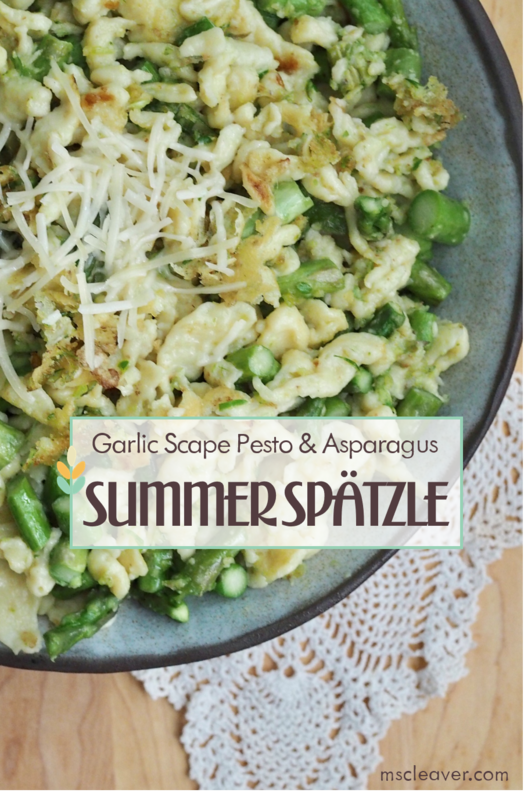 I've written before about my burgeoning love of German food, so it should be no surprise that Spätzle/Spaetzle was become a popular dinner in the Cleaver household. I'll admit that I've yet to find a way of making Spätzle that doesn't make a huge mess (the noodle dough is super sticky! ), but I find the end result worth it. The recipe makes a generous amount of noodles (four adult-sized portions) and can be easily doubled. Not in garlic scape season? Try substituting in chives, wild garlic leaves, spring/baby garlic or basically anything in the edible allium family like scallions, shallots, or leeks. No fresh asparagus around? Substitute with frozen*, or try green beans, sugar or snow peas, broccoli stems - anything green with a snap. *Frozen veggies beat out of season veggies any day in my book. 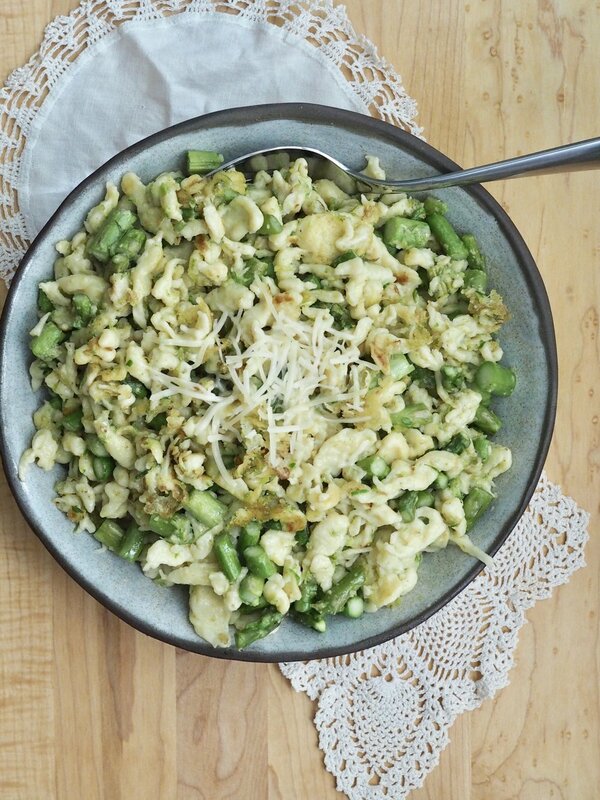 This bright and delicious combination of German-style spätzle noodles, asparagus, and fresh pesto stands as a light summer meal on its own, or pairs beautifully with sausage, chicken or pork (especially Schnitzel!) for a heartier meal. Note: The pesto can be made in advance, if desired. 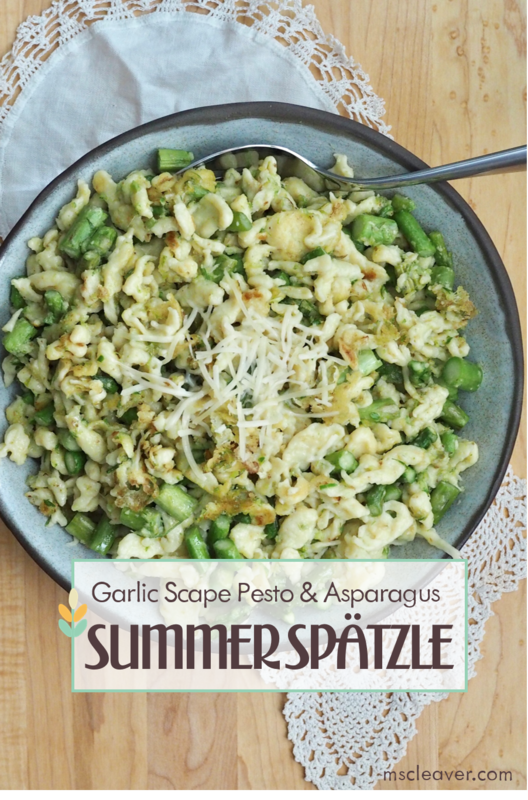 Note: There are several methods to "pressing" Spätzle into it's shape. There's a Spätzle press if you have one (I don't). You can also use a potato ricer on the largest holes, "cutting" it from a board, squeezing it from a bag, or my most frequently used method, using a spatula to press it through a large-holed colander. On/next to your stovetop, prepare the following: a large pot of water set to a rolling boil, a large frying pan oiled with approximately a 2 Tablespoons of olive oil (don't heat it yet), and a large bowl filled with ice water. Make dough: In a large mixing bowl, combine dough ingredients and let sit for about 15 minutes. Make pesto (can be done in advance and refrigerated): In food processor, combine scapes and walnuts, pulsing until finely chopped. Add cheese and pulse to mix. Slowly add olive oil until desired consistency is achieved. Add salt to taste. Using the method of your choice, press dough into the pot of boiling water in batches. Once the noodles begin to float (about 2 minutes) removed with a slotted spoon and place in the ice water. Make the rest of the noodles in the same fashion. Drain the noodles. Heat frying pan. If using frozen vegetables, saute them lightly first, then add the drained noodles. If using fresh vegetables, add both noodles and vegetables to the frying pan at the same time. Fry the noodles until golden brown, adding extra oil if it starts sticking to pan. Add the pesto and mix until well distributed. Remove from heat and transfer to serving bowl. Garnish with additional shredded cheese. Adapted from What's for Lunch, Honey? 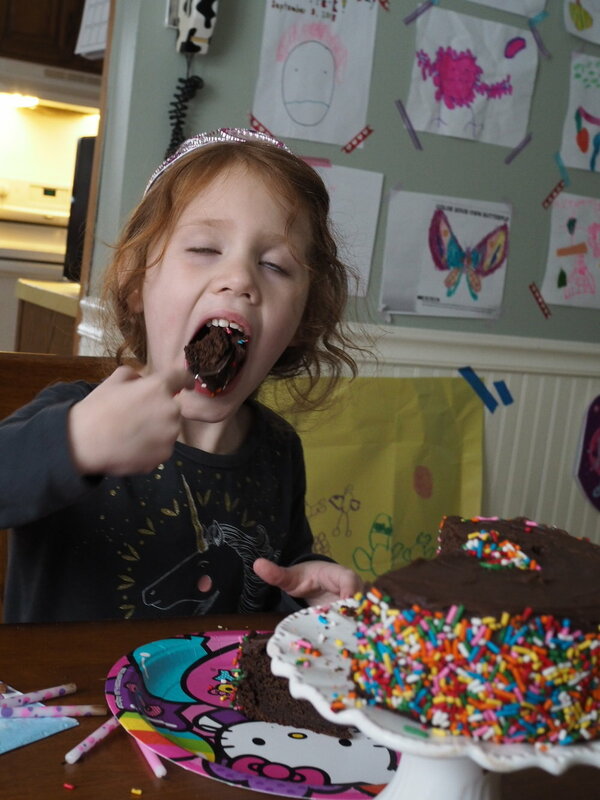 Little Miss Cleaver just turned five in March. (I know, I have no idea how that happened so fast either). To celebrate such a momentous occasion, we had a big friend birthday party about a week before the actual day. But, in LMC's words, the "real party" was the one with family on her actual birthday. So even though we were solidly cupcaked-out by that point, a cake was still in order. Enter this deeply chocolaty, but petite cake - just enough for the three of us to handle and cute to boot. There are hundreds of chocolate cake recipes out there, so I'll just say that this one was still really moist after three days at room temperature and I use my blog as my own personal recipe box and I wanted to put this out there so I can remember it for the next birthday. Or a really thick 6" cake, plus a small ramekin. (which is what I did). Preheat oven to 350 Degrees F. Grease pan(s) and coat with cocoa powder or use liner if making cupcakes. In a medium bowl, sift together flour, cocoa powder, baking powder, baking soda, salt, In a small bowl or large measuring cup, combine coffee, milk, and yogurt. 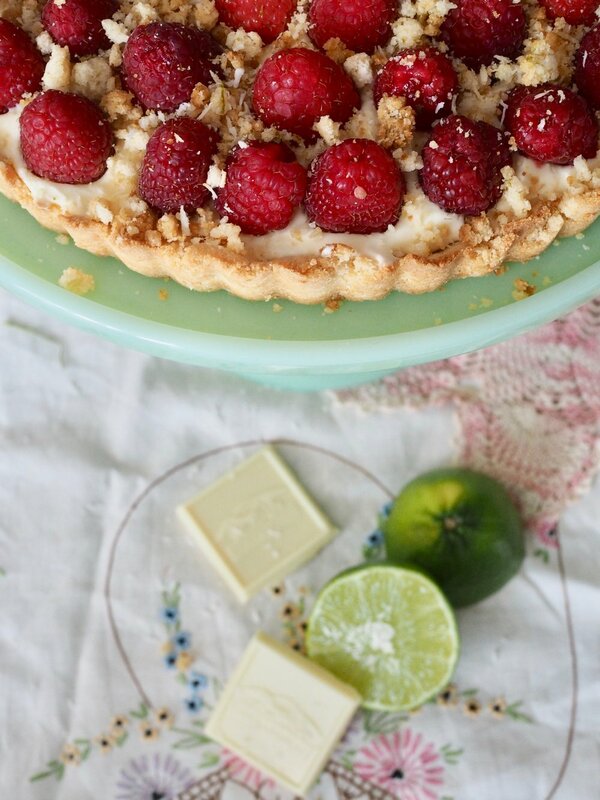 In a large bowl, cream together the butter and sugar until light and fluffy. Add egg and vanilla to sugar and mix until well combined. Starting and ending with the flour mix, alternate adding flour mix and yogurt mix to sugar/egg mix, making sure batter is thoroughly combined before each addition. Scrape batter into prepared pan(s), keeping the distribution as even as possible if using multiple pans. Bake cake until a tester inserted in the center of the cake comes out clean. Start your timer at 20 minutes and check every 3-5 minutes thereafter, cooking times will vary based on which pan you choose. Cool cake in pan for 10 minutes then invert unton rack to cool completely before frosting. To make frosting: Beat butter until light and fluffy. Add cocoa and powdered sugar to butter. Add milk a tablespoon at a time, until desired consistency is achieve and then beat in vanilla. 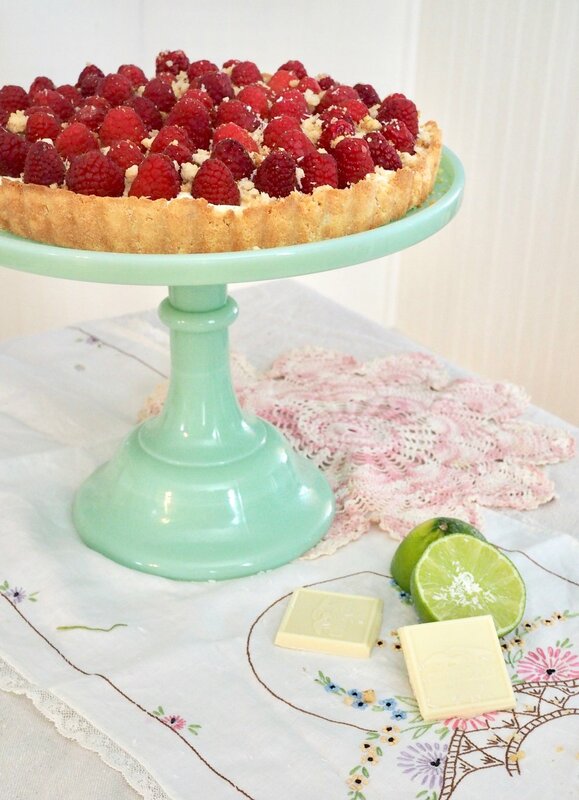 To decorate as shown: Place a large amount pf sprinkles into a pie pan or rimmed baking dish. Frost sides, but not top of cake. Being very careful, tilt the frosted cake into the pie pan and roll until sides are coated with sprinkles. 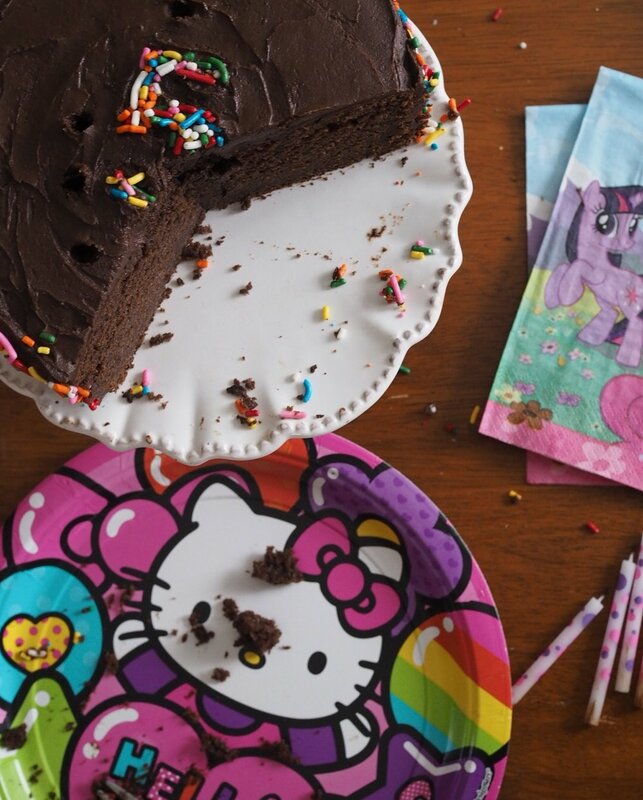 Gently place cake unto serving dish or stand and press sprinkles into the side as needed. Frost top of cake. To make number, print out number of choice in a very large font (I think I used Impact here) in the center of a 5" circle. Cut out number with sharp scissors or an craft knife. Place template gently on top of cake, trying not to stick it to the frosting. Pour sprinkles into your template, mushing them into the frosting gently with you fingers and carefully remove template. Goes excellently with a glass of milk. Adapted from Ghirardelli's Grand Fudge Cake (aka the one on the back of the cocoa powder bag). 3/4 cup apple cider, heated to boil. Wet the rim of a heat proof glass and sugar with the raw sugar. Place slice of spiced butter in bottom of glass and top with rum and hot cider. Mix until butter is dissolved. Top with a generous squeeze of orange juice (about a Tablespoon). Garnish with apple slice or fan and serve hot. Combine all ingredients in a medium mixing bowl and mix with a wooden spoon until well combined. Transfer butter mixture to wax paper and roll into a log, approximately the size of a stick of butter (this will help to measure later). Wrap butter tightly in wax paper and plastic wrap and store in fridge, allowing to firm up. Can keep keep for up to two weeks. Also great on toast! Is there anything more summery than ice cream? Growing up, we had an ice cream maker. It was a behemoth of a thing, one of the old-fashion kinds that had an electric churn inside an outer container you had to fill with crushed ice and rock salt. We didn't use it much, rock salt and heavy cream weren't things we usually had sitting around the house, but once a summer it would make an appearance. The sound of the motor still rings clear in my mind, a sound of anticipation, the harbinger of deliciousness to come. When we did make it, it was always vanilla. I never recall getting any fancier than that, but to a kid, it was enough. When Mr. Cleaver and I got married, we got a small, more modern ice cream maker as a wedding gift. It held about a quart and had a bowl you froze in the freezer, no rock salt required. I've tried making a dozen or so batches or ice cream and sorbet in that maker, with limited success. It never seemed to truly freeze/whip up properly and the ice cream would melt ridiculously fast. So this summer we decided to upgrade. Based on the recommendation of America's Test Kitchen, we purchased a Cuisinart ICE-21 (in pink of course! ), and while we've only used it twice thus far, these results have been so much better that the bowl has earned a permanent spot in our freezer and heavy cream a regular spot on our shopping list. My favorite part of homemade ice cream is using what's in season to make it really fresh ice cream. The obvious options - strawberries, raspberries, etc - all make delicious ice creams and sorbets, but the herb garden is also a great place to turn to for ingredients. 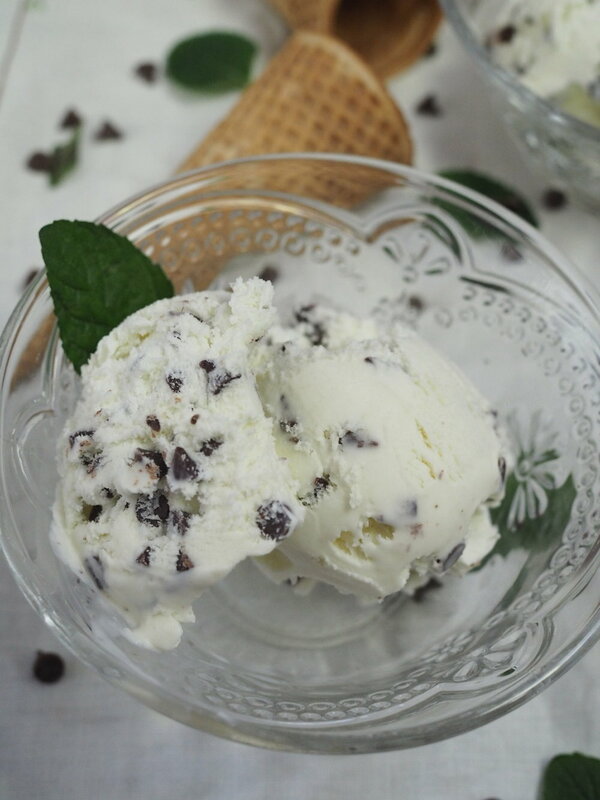 Especially in the early weeks of a garden before the berries ripen - and anyway, it doesn't get any more classic than Mint Chocolate Chip. Unless you count vanilla, of course. 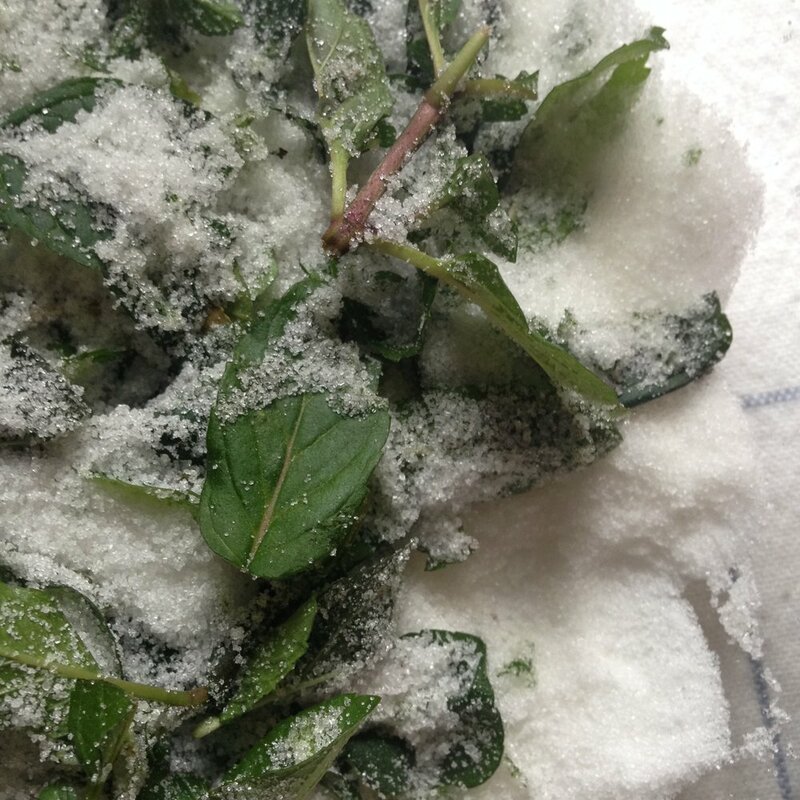 Combine sugar and salt in a large bowl and top with mint leaves. 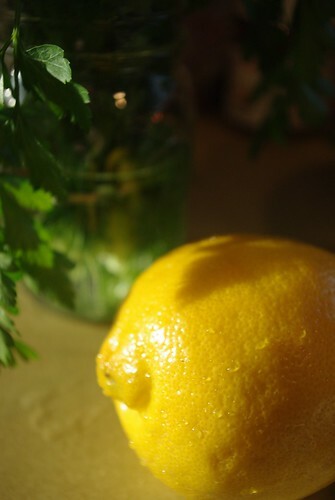 With a muddler or the bottom of a sturdy wooden spoon, crush mint into the sugar to release oils. Pour in milk and cream and stir until sugar dissolves. Cover bowl and place in back of refrigerator, preferably overnight, but a minimum of 3 hours until mixture is quiet cold. Set up ice cream maker, per manufacturer's directions. Strain mint leaves out of milk/cream mix and pour into ice cream maker. When ice cream begins to appear firm, add chocolate. While tempting to eat directly out of the machine, taste a bit, and then scoop the rest into a reusable container and store in the freezer for several hours until firm. Serve in bowls or cones and enjoy! I love baking for the Holidays. 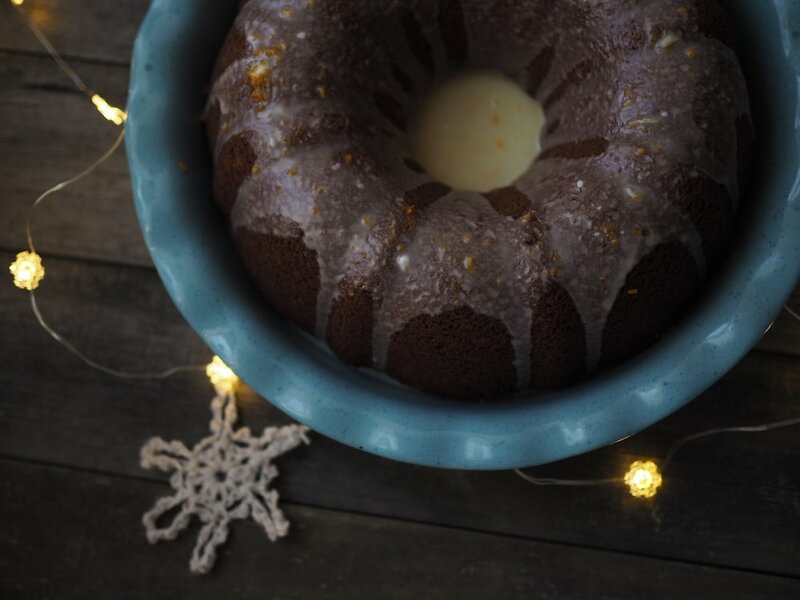 There's just something about the flavors of winter I find so appealing , the combination of nutmeg and cinnamon and citrus. The depth of molasses and wine. 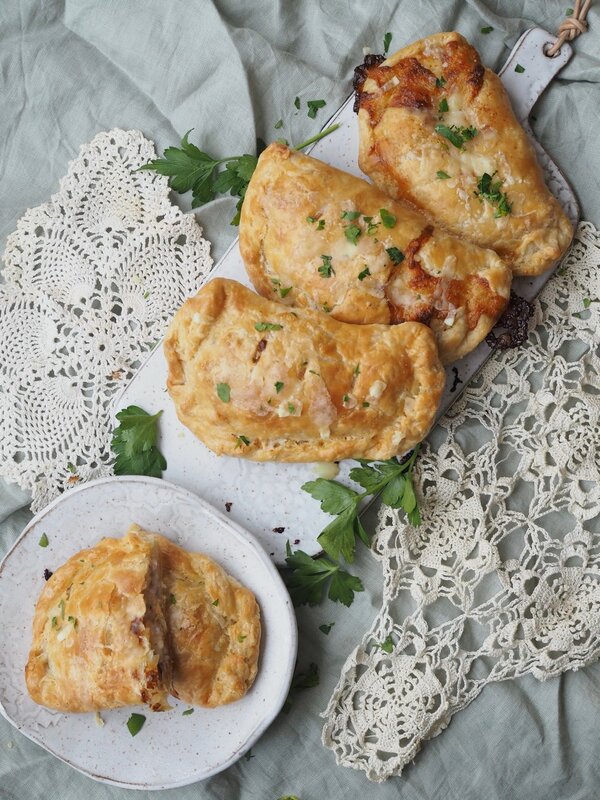 That's why this pairing is perfect combination for any winter gathering, and since there's a lot of overlap in ingredients, they're easy to make together. Gingerbread is an obvious choice for the holidays, but this take on the classic has a soft and light crumb, and isn't overly dense or spicy, as I find some gingerbread to be. The cake is best when the spices are allowed to meld for a bit, so make the day ahead, if possible. 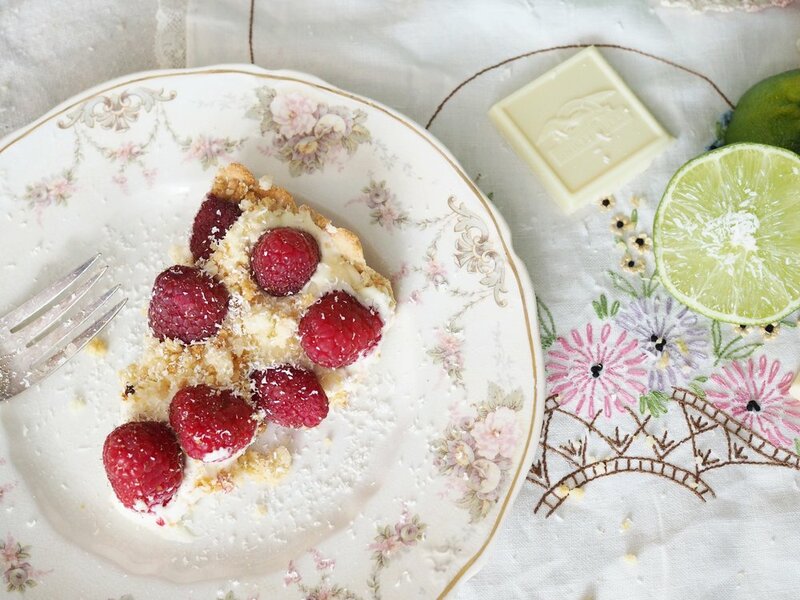 For a spicier cake, increase the amount of ginger, or replace powdered with fresh. You may also increase the amount of molasses, as desired. Preheat oven to 350 degrees F. Grease and flour or spray a 10-cup Bundt pan (I find Pam with Flour works the best for those tricky Bundt pans). In a large mixing bowl, cream butter until smooth using a wooden spoon or mixer. Add brown sugar and cream until light and fluffy, making sure butter is fully integrated and there are no visible chunks. 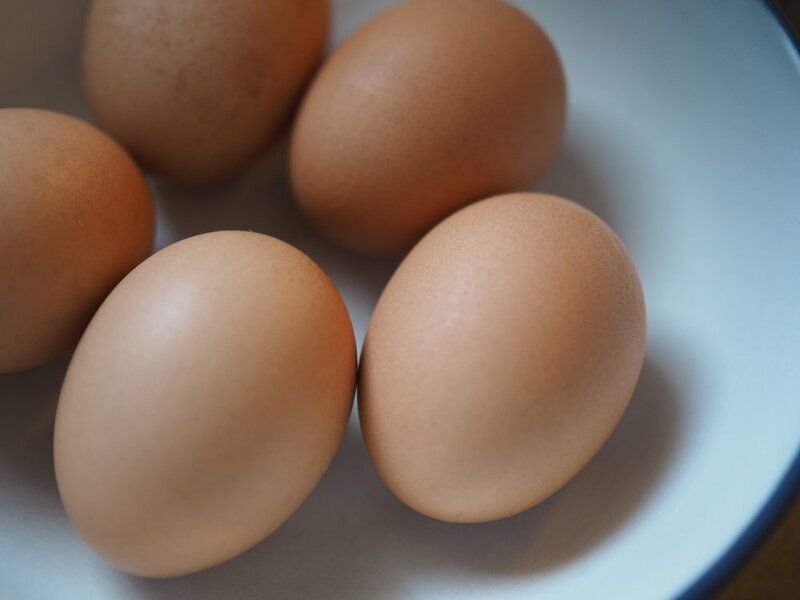 Add eggs to butter mixture one at a time, mixing in completely before adding the next egg. In a separate bowl, shift together flour, baking powder, baking soda, salt, and spices. In a small bowl or cup, mix together room temperature coffee with the molasses. Add the 1/3 of the flour to the egg/butter mix, then 1/2 the molasses, 1/3 of the flour, the remaining molasses, then the remaining flour. Mix until just combined. Pour batter into prepared pan and snap against the counter to remove any large bubbles. Smooth out the top with a rubber spatula. Place in center of oven an bake for approximately 50 minutes, or until a toothpick inserted into the center of the cake comes out clean. Let cake cool in pan for about 7 minutes, then turn onto a cooling rack. 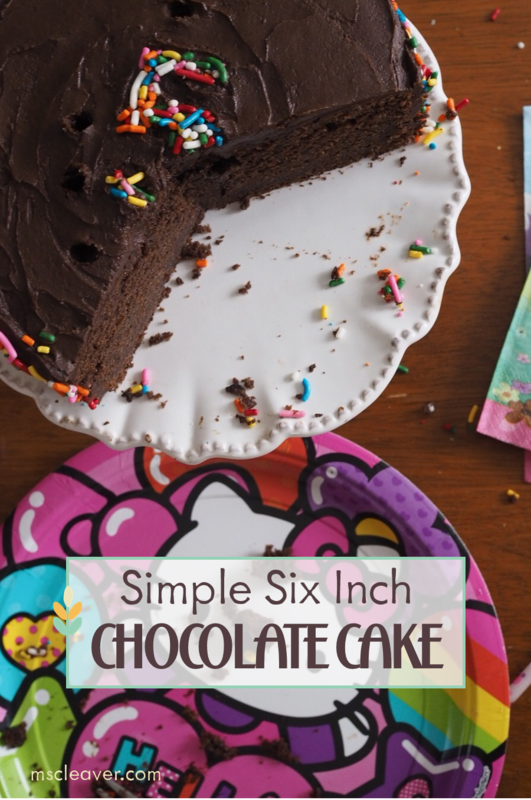 Let cake cool completely, transfer to serving plate, and then glaze. To make glaze: mix all ingredients, adding liquid slowly until desired consistency is achieved. Pour over cooled Bundt cake, making sure to allow glaze to drip down both sides. Scoop extra glaze out of cake center and re-drizzle as desired. 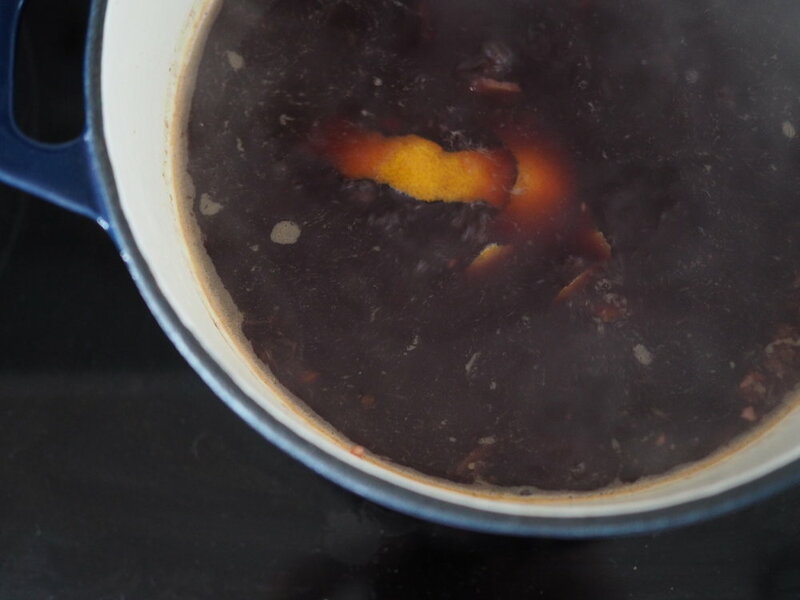 Glühwein, or German Mulled Wine, is perhaps less familiar, but a wonderful addition to winter gatherings. I discovered Glühwein when searching for mulled wine recipes, and then immediately emailed a German friend for her take on the tradition. I've merged her recipe with some I found online, but mulled wine is something that is easy to vary to meet your own tastes. Throughout my wine-mulling process, I kept running to Mr. Cleaver with a hot mug and saying "taste this." We quickly ran through the batch at my knitting group's annual Christmas fête, so I think my test-taster served me well. 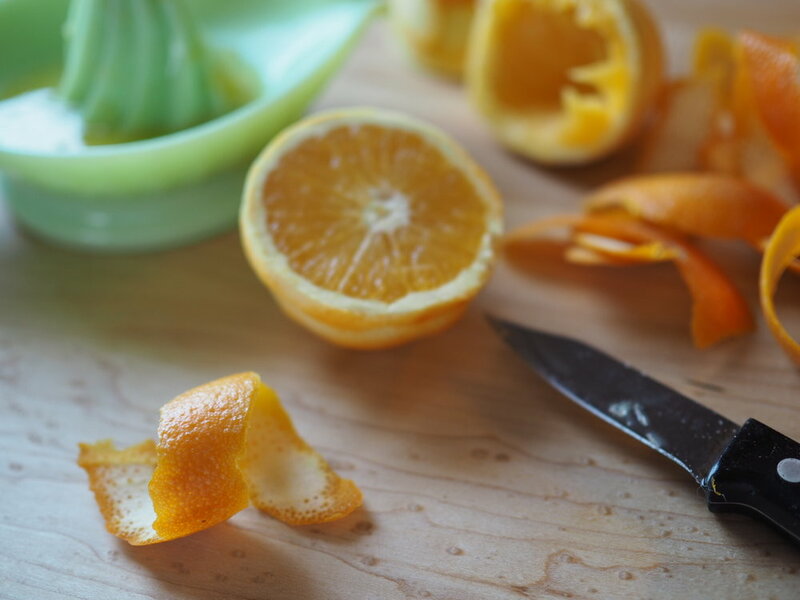 Using a paring knife or vegetable peeler, peel all citrus into wide strips, avoiding as much of the bitter white pith as possible. Juice all fruit, making up the difference with pre-made orange juice as needed. Reserve some peels for garnish. Combine wine, juice, remaining peels, and spices in a heavy covered stockpot. Bring pot to a low simmer. Add Brandy and continue to simmer. Add sugar to taste. 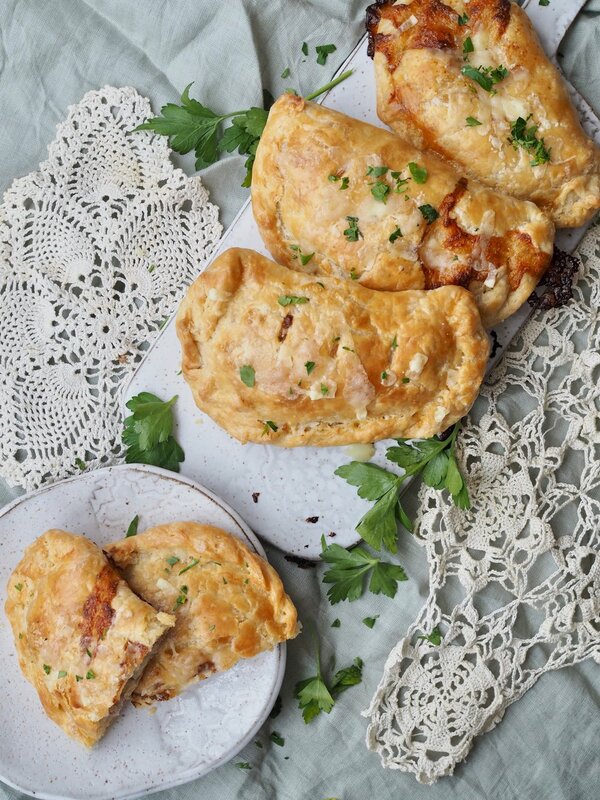 What are your favorite holiday recipes? Share links below!! On Sunday I wrapped up my 40+ days of vegetarianism with some french toast and bacon, but I thought I ought to do a wrap up of sorts. Over the course of this year's experiment I got a lot of questions about it from people, mostly the real vegetarians in my life, so while I don't really have any new photos for this post, I do have a Vegetarian Q&A. Q: Did you miss meat? Q: Did you feel better/healthier? A: I didn't feel better, or less sluggish or anything physically, but mentally I did feel that I was introducing better food choices into my world. Q: What was the hardest part? A: Cooking without a doubt. I'm not a great and/or particularly enthusiastic cook to begin with, so there's that. But mostly when I started this whole thing I didn't have a much of a vegetarian cooking repertoire. 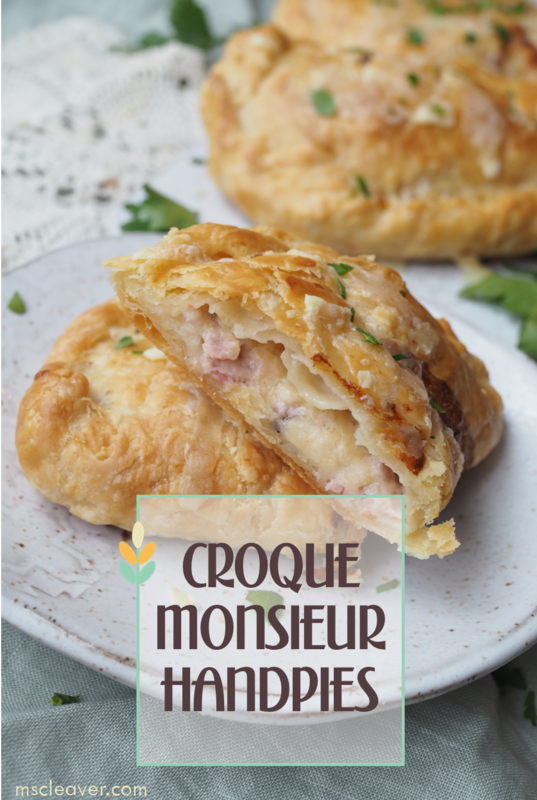 So there was a big shift in having to change the way I grocery shop, and find recipes, and trying out 2-3 new recipes a week, with mixed results. Though I wouldn't say my repertoire is huge now (I had more failures than successes methinks), but I do have more options, as well as an ever expanding Pinterest board of recipes to try and an expanding feed-reader full of vegetarian cooking blogs, so I expect that to continue to grow. I did find that when all else fails, make a pizza. Q: What was the best part? A: Discovering new foods. I'm particularly a fan of quinoa now, which I'd never had before, and I forgot how much I like spinach. I like veggie-burgers. 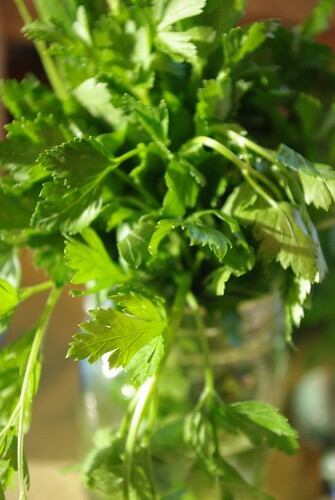 And I'm surprised at the number of recipes that called for parsley, which I had always thought of more as a garnish, but no more! It also made me look beyond the same old some old at the grocery store and on menus. I could still expand my range of vegetables though. Q: Would you consider staying a vegetarian/doing it again? A: I don't think that I will permanently be a vegetarian, I like keeping my options open, and for me, it's about health more than any moral imperative. 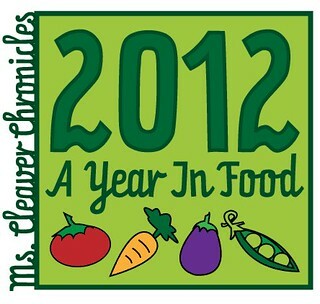 But I would like to continue to incorporate more vegetarian eating into my diet going forward. There's also a few improvisations, like the aforementioned pizzas and some veggie masala that was quite tasty. The light in the evening is coming back in spades theses day, for which this California transplant is grateful. It makes me feel so much for active and productive in the evenings, which is great, because it's been a busy week and it's going to be a busy spring. Because with all the bright happy sunniness of spring comes new responsibility - probably a day a late and a dollar short, but I've started thinking about all the stuff I need to do to get vegetable garden in the ground this year, not to mention spring cleaning, repainting the peeling deck, and all that sewing I want to do as soon as it starts getting warmer. But for today, I'm taking it easy (as much as that's possible on a work day) and not worrying about all the work that's to come. Deep breaths, and one day at a time. 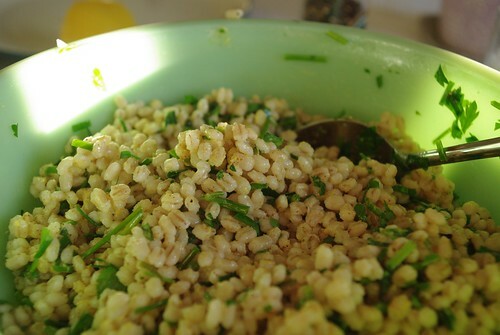 All photos of Barley Herb Salad from Martha Stewart Living. Which is totally delicious, especially if you add extra mustard.